Understanding the dynamics of how growth-promoting mutations arise and accumulate in a population of cells is a fundamental problem underlying our understanding of tumorigenesis, drug resistance, and the treatment of cancer. 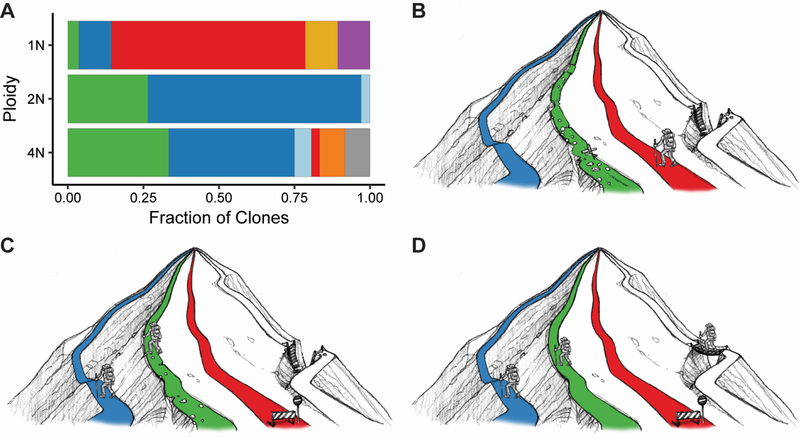 We use experimental evolution, mathematical modeling, and comparative genomics to understand the impact of mutations on adaptation of a cell and its surrounding population. We recently optimized a flow cytometry-based system that enables us to detect the acquisition and spread of beneficial mutations within a population, and used this system to compare budding yeast strains that varied by genome copy number or pl﻿oidy (Selme﻿cki et al., Nature 2015). We found that polyploid yeast adapted more rapidly than isogenic haploid or diploid yeast in raffinose medium, and that polyploid yeast acquired more mutations, including point mutations, large segmental aneuploidies, and whole chromosome aneuploidies. We will continue to use this system to study how changes in chromosome number (ploidy and aneuploidy), cell size, and environment affect genome stability and evolvability in fungal and mammalian cells. Our previous research identified chromosome aneuploidy as a driver for the acquisition of antifungal drug resistance in the pathogenic yeast Candida albicans (Selmecki et al., Science 2006). We found that aneuploid cells arose within a population very rapidly in the presence of antifungal drug (Selmecki et al., PLoS Genetics 2009), and that increased copy number of two specific genes found on the most common aneuploid chromosome provided the drug resistance phenotype (Selmecki et al., Molecular Microbiology 2008). The mechanisms underlying this rapid genome restructuring are not known. The influence of polyploidy on the evolution of yeast grown in a sub-optimal carbon source. Ploidy Variation in Fungi: Polyploidy, Aneuploidy, and Genome Evolution. Our chapter in the book Fungal Kingdom! Chapter 28: Ploidy Variation in Fungi: Polyploidy, Aneuploidy, and Genome Evolution.